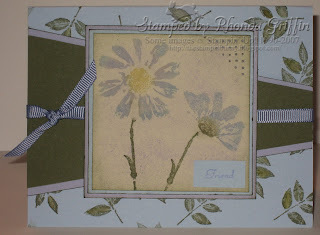 I borrowed Petal Prints from my sweet upline and have been going crazy with it lately. If it isn't retired, I am definitely going to buy it! Just thought I'd show a few cards I've made using it. 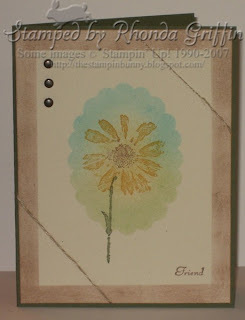 The first one was for Sketch Challenge 118, and I was trying to make the flowers look like asters. 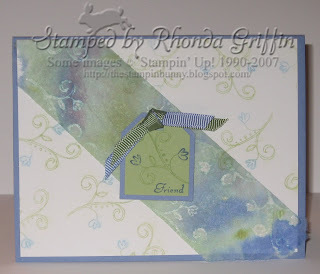 The second card was for the technique lover's challenge (TLC111) to try reverse masking. Such a pretty and useful technique! I bet this would be fun using a letter void from SU! 's chipboard alphabet. 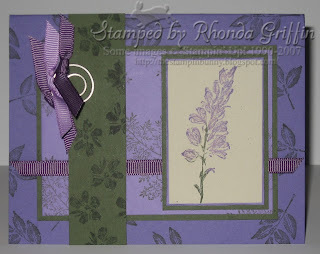 This card was for my own personal color challenge and Sketch Challenge 119....I'd not used either of these purples (Lavender Lace and Lovely Lilac) yet judging by the number of sheets of cardstock I have of them. The eggplant ribbon doesn't ~match~ exactly, but I like the variety of purples together. Today's color challenge #108 consisted of repeating two different past challenges and a theme of Birthdays. We are to send one to Daven who is in charge of Splitcoast's computer workings and one to Beate who creates so many of the great tutorials on SCS. Here's the card I made for Daven using the Color Challenge #16 colors of Creamy Caramel (was really craft, but we were allowed to substitute), Real Red and Basic Black. 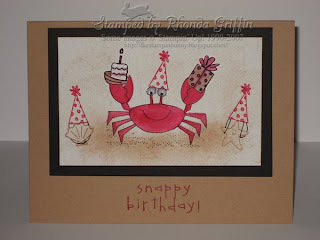 The present and cupcake shell are slid through a slit I made along Mr. Crab's pincher. I used tiny googlie eyes to add a bit of dimension-wonder how they will make it through the mail? I might use a bit of bubble wrap over the top of the card to protect them. This Crab and Company set is sooo fun to use. I imagine myself making several more of these with different colors! 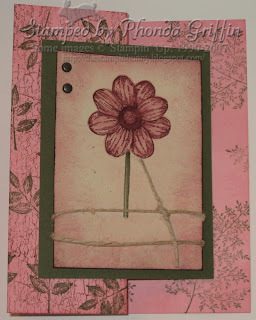 This card, made for Beate, uses the Color Challenge #65 colors of Bravo Burgundy, Pretty in Pink and Always Artichoke. Thought I couldn't go wrong with Touch of Nature, but I should have used Bravo Burgundy for the main card I think. The front of the card is folded back on itself if the card looks unusual to your eye.